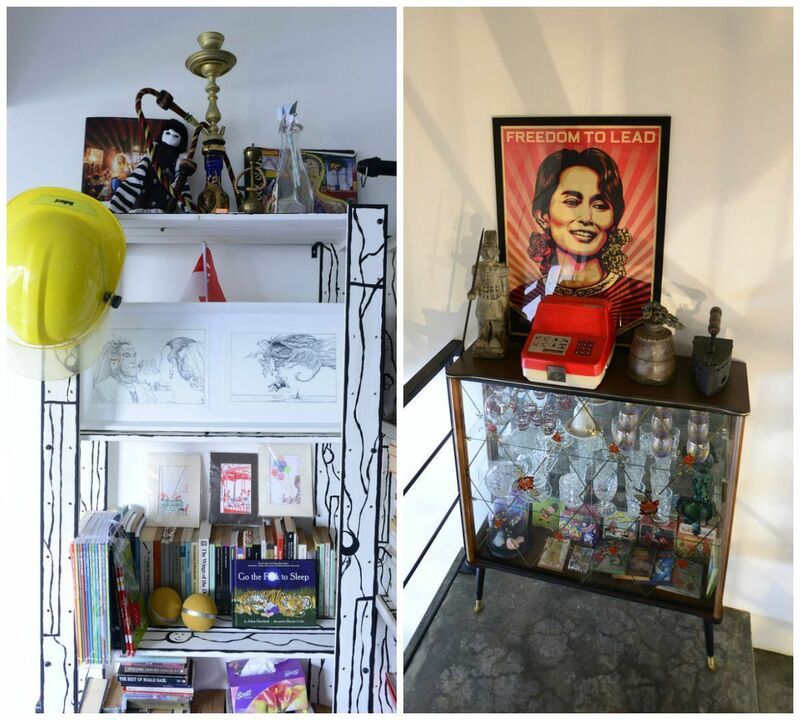 Upcycled items and restored furniture pieces (including kopitiam chairs) are housed in this Clementi flat. 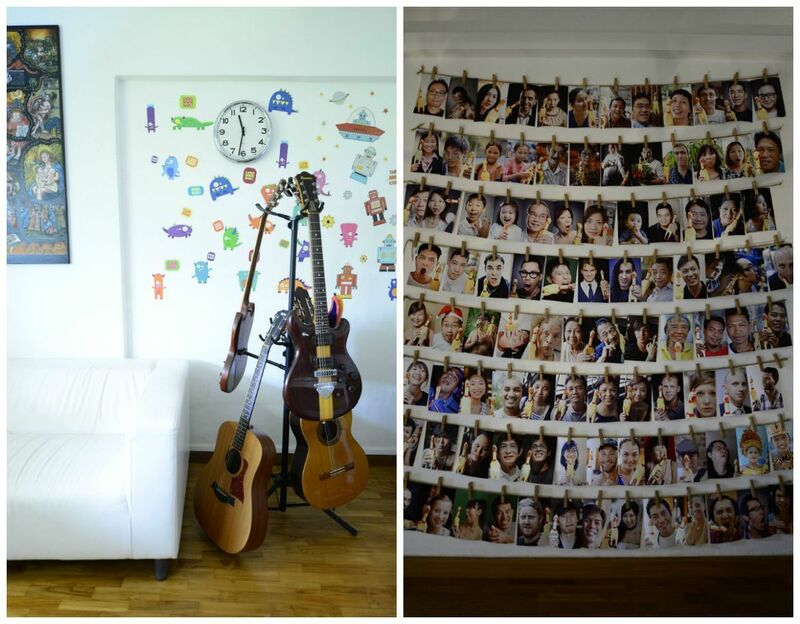 Discover the charm of this fun, no-rules, quirky home. 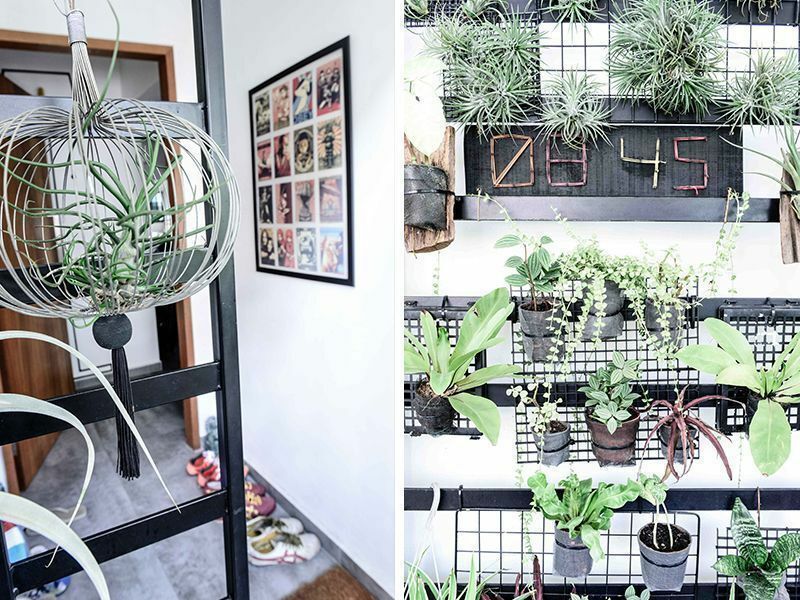 When Jay Sim and Pearl Leong moved into their 1,550-sq.-ft. maisonette in Clementi, they agreed on one thing: that their house should not have a theme, that it should not look perfectly done. While most homeowners would usually pick an overall look to tie up all the elements in their space, this pair wanted it differently. "The most important thing was to not have a theme," asserts Jay. "The house looks a bit messy, it looks like it doesn't have a direction. But that's the way we like it." Pearl adds that they intended their entire house to look like they designed it themselves. For them, the look and feel of the house should be a product of the collective idea of the couple living in it. "Our house didn't have to look perfect. It didn't have to look like people would immediately like it. We just want it to be our own," she says. Jay: "Pearl likes plants. We like this whole vertical gardening style." 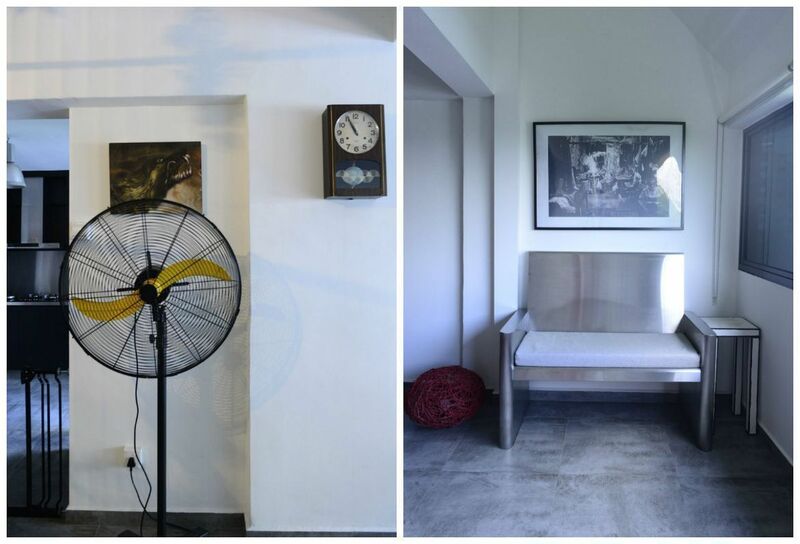 (Left) An ordinary fan was transformed into something unique and quirky. This fan is available at The Rocking Chair. (Right) Jay's sister gave this metal fabricated bench to the couple as a housewarming gift. Meant to be a lounge chair beside the huge window in the house, this has become their cat Ginger's royal throne. After all, this is a house that's brimming with creativity and ingenuity. 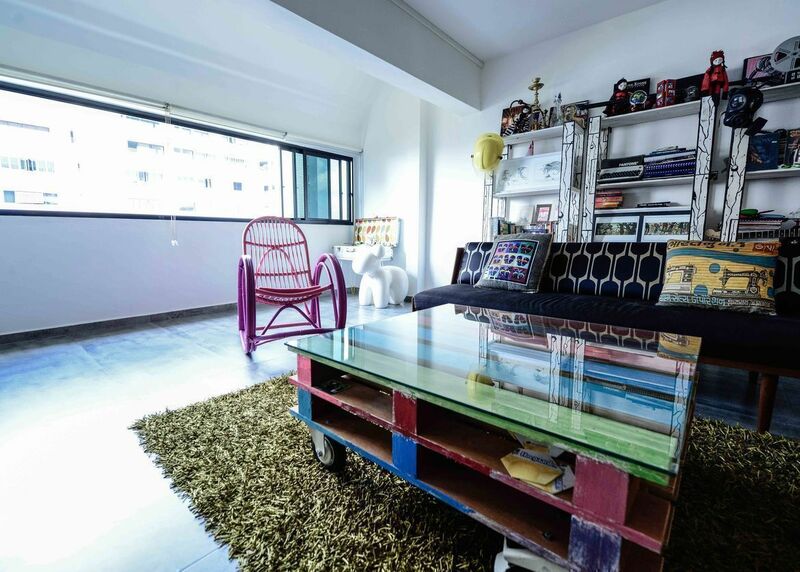 Most of the furniture pieces in this flat are items restored and salvaged from the HDB trash bin and upcycled flawlessly, thanks to Jay's creative mind and hands. Upon entering their home, the first things that will catch your eye are the pink rocking chair and the multi-hued coffee table in the living room. Apparently, the rocking chair was Jay's first exercise in restoring items. "It took me about three to four days to complete repainting it to pink," narrates Jay. The couple has gone a long way since his first furniture DIY project. This little experiment gave birth to a vintage furniture store, which they named—you guessed it!— The Rocking Chair. Here, Jay restores furniture sourced from London while Pearl is in charge of sales and marketing. Jay also worked on the table in the living room. It took him a week to splash hues of red, blue, and green from leftover paints onto the wood pallets. The couple also threw in a green rug from Air to complement the tiles that look like cement flooring. Why the bright colours in the furnishings? "Everything, from the fixtures to the walls, is in black and white. So colours come into play through our furniture," explains Pearl. Jay and Pearl opted to design their home all by themselves. As Pearl puts it, they want to be able to throw in items they want to display, without having to worry about some interior design rules. Housed in a DIY shelf ("It's an IKEA shelf. We found it lying around so we painted it to look a bit different," says Jay.) 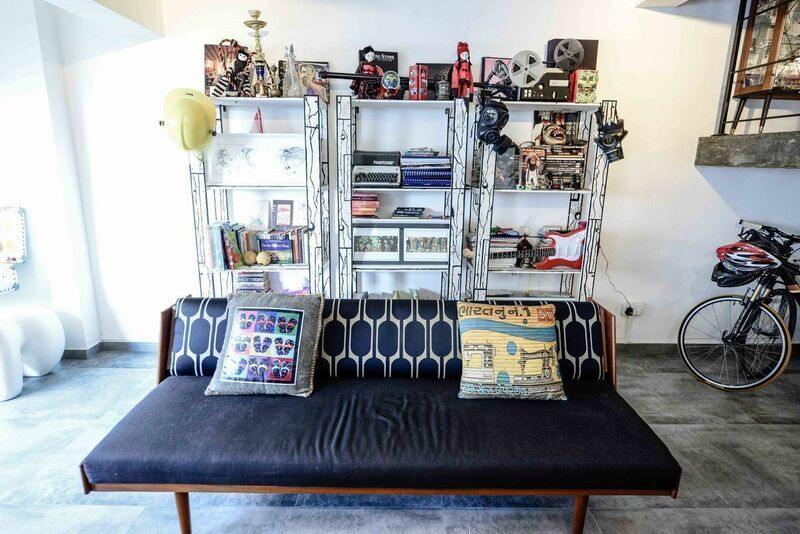 behind the vintage sofa are some of the couple's precious collections of photography books, rock magazines, comic books that Jay has been collecting since the '80s, a vintage typewriter, and souvenir items from their travels. Sitting on the stairs to the second level is a cabinet full of vintage items, including a coal iron from Pearl's grandparents. The glassware collection inside is a gift set given by Jay's grandpa to his grandma when his grandparents got married. Distressed table bought from a vintage shop and DIY kerosene lamps lend a vintage vibe to the dining area. The mismatched chairs are a case study for Jay's habit (or hobby) of picking up trash and turning them into beautiful pieces for the home. "I don't really like anything matched as you can tell in the whole house and it translated to chairs as well. Two are kopitiam chairs I picked up from a restaurant that closed down while one of the chairs I picked up after someone threw it out downstairs," he explains. On the wall is a display of black and white photography, one of Jay's many passions. He loves shooting people, street style. Displayed on the dining area are his shots from trips to Bali (fishermen at the end of a work day) and Vietnam (a woman from the Hmong tribe). The other photo shows scenes from the Thaipusam ceremony in Singapore. 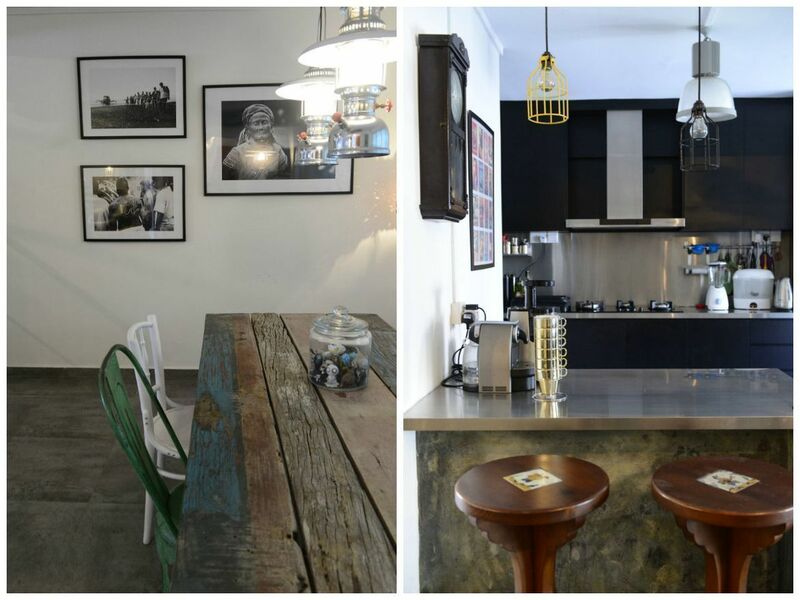 The kitchen employs an industrial look, courtesy of the metal top counters, pendant lighting, and neutral colour scheme. "It's all stainless steel. It's very easy to dump stuff, cut on it, anything you want to do is really handy. I'm not one who's afraid of scratches on tabletops so this is perfect for me," says Jay, who also worked his magic on the reclaimed bar stools. 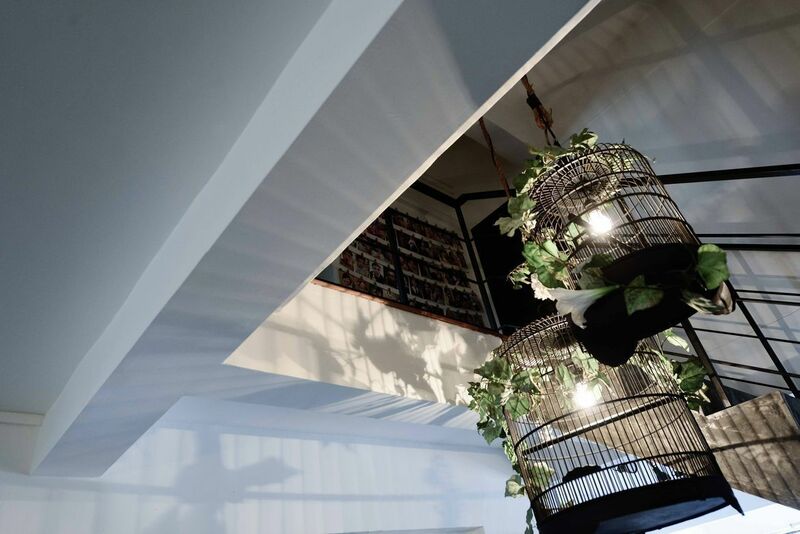 Another creative project in the house are the birdcage lamps hanging on the ceiling by the stairs. The vines that deck the cages were the same vines adorning Jay and Pearl's wedding car. 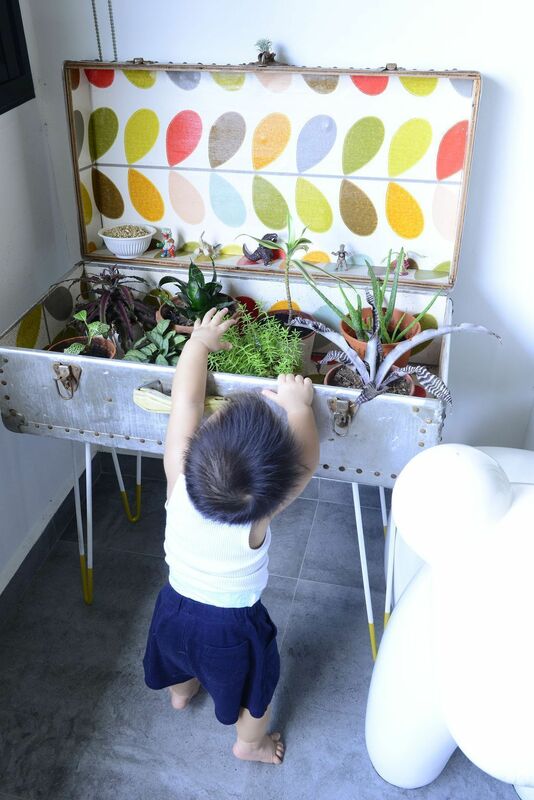 In this corner of their home, Pearl enjoys her two passions: doting on their one-year-old son and indoor gardening. The couple upcycled an old suitcase and turned it into a planter box so that Pearl could grow her greens without having to go out of the house. She spends a lot of quiet time in the morning in here. Speaking of passions, Jay's eyes light up when he talks about music and photography. He highly suggests having a dedicated room for one's creative pursuits. "It's nice to have a room to escape to. I blast my music at appropriate times of the day, and my neighbours are really cool about it," he says. Also in prominent display by the stairs is a collection of photos he has taken of people with the rubber chicken he bought from a guy in Malacca. "I had this thing of taking photos of people and then one thing led to another. I started taking the chicken anywhere and asked people to pose with it," shares Jay, who counts the photos of David LaChapelle, Pornsak Prajakwit, his family and friends as his favourites among many. Jay and Pearl wanted a home that reflects their passions and interests. This Clementi maisonette, where the family of three has been living in for three years, is exactly the home they dreamed of—not perfect (we say it is beautiful! ), but very much liveable and comfortable. We'd love to feature your home. Email us at hello@cromly.com. For more interior design inspiration, go here.